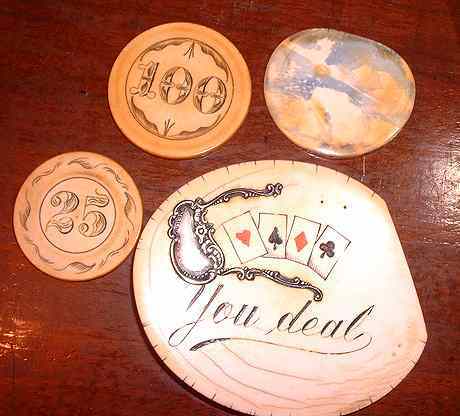 ¶ the large dealer chip is about 4" x 3-1/2." Dale Seymour shows it on page 363 of his "Antique Gambling Chips; Revised Edition" -- from a Xerox I took of my very own chip. He chose the picture of this chip to adorn his title page to the section on "Dealer Chips." It is made of ivory and sterling silver -- if you look close at the second picture, you can see the word "sterling." I imagine that the sterling was added to let one more easily push the buck to the next dealer. The entire sterling piece is an overlay (stands out in relief). The ivory is very solid with only hairline cracks. ¶ the smaller ivory buck is about 2-1/4" x 1-3/4." The reverse side is nice and smooth -- too bad it must have rested on some paint or cleaner agent once. 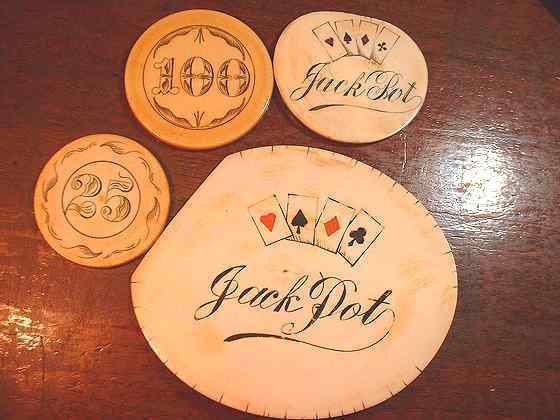 ¶ the "100" ivory is 2" in diameter! It is on page 99 of Lenny Schneir's "Gambling Collectibles -- a Sure Winner." I allowed Lenny to have it photographed for his book. He describes it as "c. 1860's: Largest Ivory Chip Known -- two inch diameter! This hand scrimshawed $100 ivory chip is among the most valuable of all ivory chips" At least in 1993, when he wrote the book. ¶ the "25" ivory is one of my better ivories -- 1-3/4." diameter. Be sure to take a look at my wonderful set of ivories originally made for, and owned by, the fabulously wealthy industrialist and philanthropist P.A.B. Widener (1834-1915). 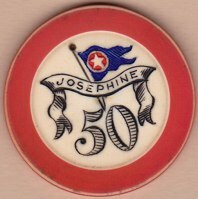 He kept it on his 225-foot yacht "Josephine," named after his wife. Full story and pictures here.